Located on the second floor of Elements shopping mall, Greyhound Café has officially unveiled its first flagship restaurant. Staying true to its artistic direction, the new 4,500 square feet restaurant combines authentic Thai dishes served with a creative and contemporary playfulness that will leave you feeling satisfied. Step inside the restaurant to feel an instant energetic vibe, resembling that of Bangkok. This is further enhanced with mural street art by Bhanu Inkawat, Creative Director of Greyhound. While the spacious main dining room is the perfect setting for a casual catch up with friends or family, the three private rooms provide the maximum dining enjoyment for groups or even business meetings and lunches. For special events, book a room overlooking the harbour views. As a celebration of the opening, Thai executive chef Niran Vongsumran has whipped up 10 exclusive new dishes, tantalising Hong Kong gourmands. 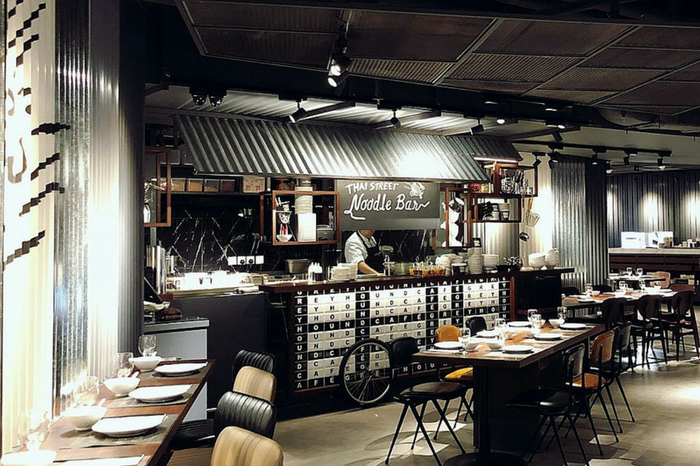 Adding a touch of innovation and individuality, the new restaurant features an open drinks and dessert bar along with the very first Greyhound Café Noodle Bar. Convenient and fast, the Noodle Bar is the perfect place to grab a snack before a showing at the cinema (located opposite the restaurant) or for those needing a lunch- or dinner-to-go. 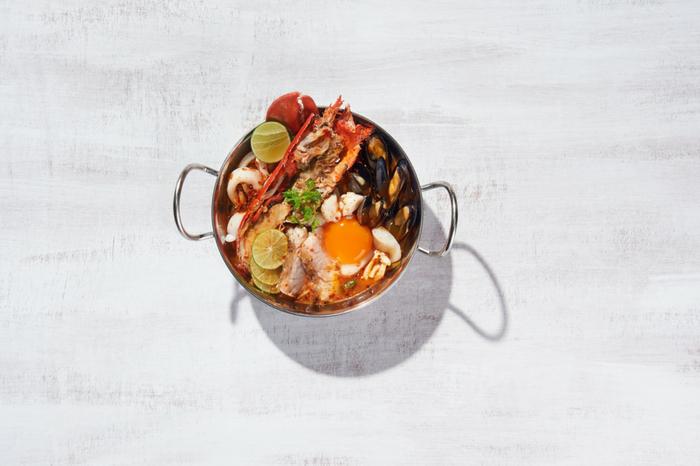 Slurp your way through the delectable Lobster Tom Yum Super Bowl (HK$268) made with Boston lobster, scallops, black mussels, baby squid and tiger prawns, served piping hot with the spicy soup and authentic “Thai Mama” instant noodles, just as you would taste in Bangkok’s night markets. If you are feeling particularly hungry, the popular Yellow Crab Curry on Rice (HK$198) combines an indulgent mix of stir fried crab meat alongside jasmine rice and clear soup of the day. What’s more, there is no need to grapple with de-shelling, saving you from any awkward stares. The creamy consistency paired with the right dash of spice makes for a soul reviving and heartwarmingly satisfying treat. *Warning: You may require a post-lunch nap! 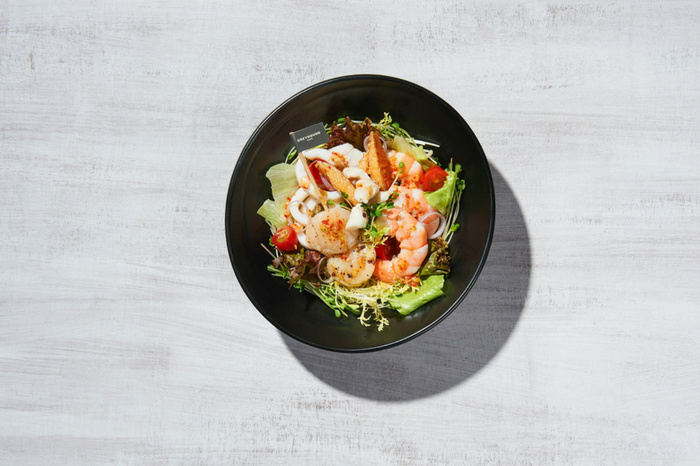 For a lighter option, the Thai-Style Spicy Seafood Salad (HK$158) combines mixed green salad leaves with a grilled giant scallop skewer, poached tiger prawns and sea bass and baby squid, topped with a delicious serving of fried salmon taro, all dressed in a tangy spicy Thai dressing. Wholly refreshing and suitably spicy, this is also a great dish for small groups to share. 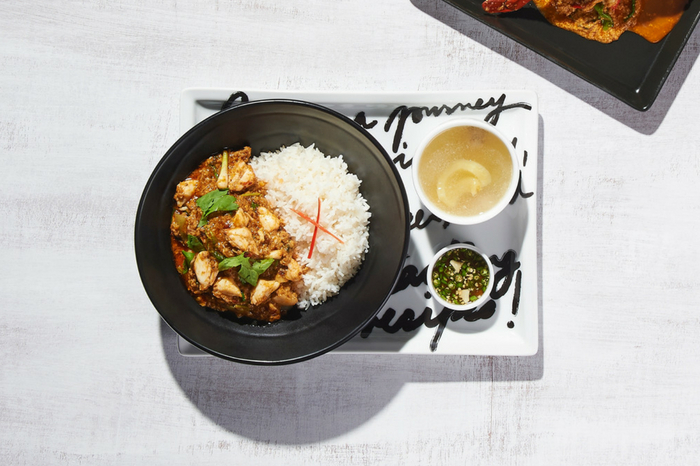 Inspired by local Hong Kong dishes, Greyhound Café also introduces a selection of exclusive dishes which will have even the city’s finest gourmands jumping for joy. The Stir-fried Braised Tendon with Flat Noodles (HK$118) topped with a soft boiled duck egg, effortlessly marries the classic flavours of Thai and Chinese cuisines to create a heavenly masterpiece. 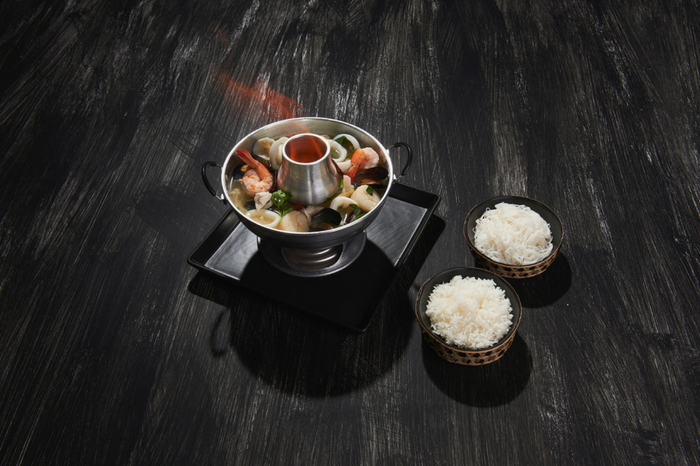 For hot pot lovers, the Spicy Hot Pot Seafood Pontoon (HK$248) is just what you need. The hot spicy clear soup with black mussels, tiger prawns, baby squid, jumbo crab meat, US scallops and Enoki mushroom comes served with vegetables and rice vermicelli. Wholesome and hearty, this dish will leave you smiling. To wash down your treats, opt for one of the many refreshing drinks on the menu offering anything from healthy cocktails (yes, it’s a thing!) to an authentic Thai Iced Tea or Coffeewith milk and of course, bubbles. If you have room for dessert, be sure to try a sweet treat or two from the “Mango Mania” summer promotion. 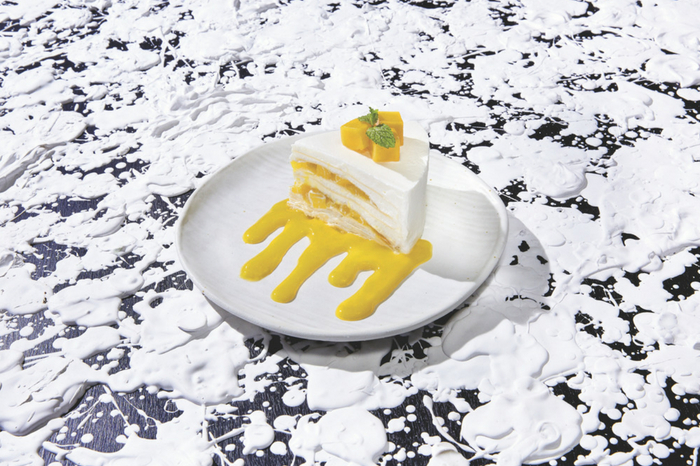 With a daily shipment of Thai mangoes, the talented dessert chefs will magically transformed this fruit into a Mango Crepe Cake (HK$78) or Sticky Rice and Mango Parfait (HK$78). Greyhound Café’s newest edition is one that can easily (and very quickly) become one of your top ‘go-to’ restaurants. Whether you are enjoying a family meal or a business luncheon with your clients, the beautiful airy space paired with the energetic vibes and exquisite dishes will have you returning time and time again.